ON THE COVER: Charles Weinstein, right, and his son Reuben of American Engineering Fabrics represent the second and third generations of a family committed to recycling and conservation. While social responsibility is an ideal to most companies, at BOOM Environmental Products, it is considered part of a long-standing family tradition to develop a business that creates valuable products with recycled material. Founded by Reuben Weinstein. BOOM is a third generation business committed to recycling and conservation. The Weinstein family continues to develop innovative recycling methods and techniques to launch their respective businesses. Beginning some 85 years ago with Jacob Weinstein, the family established A. Weinstein & Son, a wool trading and blending company. He later branched off into buying recycled wool and selling it to be processed in the manufacture of other products. Following in this tradition, his son, Charles Weinstein. started Trans American Spinning Mills in 1946 and broadened the company's products through the purchase of recycled wool and synthetics to manufacture yam and blankets. He developed a new niche, utilizing nylon tow from World War II glider towing line and recycling the material for the manufacture of yarn for sweaters. 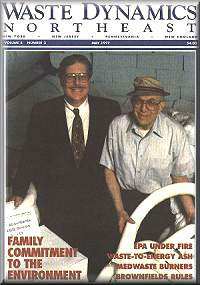 In 1981, Charles and his son, Reuben launched American Engineering Fabrics (AEF), dedicated to the manufacturing of polyester and polypropylene geotextiles for the construction industry. In the third generation, Reuben Weinstein, implemented this same innovative thinking with BOOM Environmental Products. When the Exxon Valdez hit the rocks, it instantly sparked the emergence of the absorbents industry. Weinstein was ready to meet the challenge by quickly turning the family's textile company in a new direction. In 1989, BOOM Environmental Products, a sales and distribution arm of AEF, seized the opportunity to adapt its geotextile materials into fiber-locked absorbents. At the time, melt-blown polypropylene was the most commonly- used absorbent, but fiber-locked absorbent proved more durable and reusable. For marine spills, fiber-locked polypropylene is designed with hydrophobic fibers ---- meaning it floats and won't absorb water. The material can be custom-shaped, depending upon the application. During the Valdez spill, for example, it was sewn into 10-foot-long booms that could be easily connected to form as long a span as needed. According to Weinstein, part of the reason Boom was able to quickly respond to the Valdez spill was because it could take advantage of Trans-American's industrial fabricating capabilities. Currently, BOOM produces a series of customized packages to full fill various spill control needs. BOOM offers its fiber-locked absorbent materials, in many sizes and applications, such as pads, booms, rolls, sweeps, pillows. BOOM products have applications in a variety of industries, including use on the space shuttle during 1997. To compete, the company tries to stay ahead in the market and provide its customers with the convenience of purchasing everything they need from one place. BOOM is a distributor of drain blockers, degreasers, and pressure washers, which when combined with BOOM's own products, make for a total spill control system. BOOM's product line includes floating booms hung with vinyl tuibidity curtains that keep silt from killing fish during bottom dredging, boat bilge booms, barrel covers and loose absorbents. In addition, BOOM has developed a unique partnership with industrial launderers and dry cleaners in California, Wisconsin, Alabama, Oklahoma, Ohio and Indiana. For $150 a pound, customers have their used absorbent materials dry cleaned and returned. After 100 cleanings, the materials undergo a final treatment, ending up as rags or simply discarded. "This is complete recyclability. After sopping up chemicals and oil, most absorbents are classified as hazardous solid wastes and must be disposed of properly. By dry cleaning or laundering the absorbents and returning them to the user, companies face less liability because of improper disposal, and the material does not end up in landfills. The waste oil is refined, blended and used as fuel for firing cement kilns; the used absorbents can be thrown out or used to make asphalt," said Weinstein. Now, the company is responding to the unique needs of a new industry by designing a low-linting absorbent cloth for use in high resolution media manufacturing and clean room environments. BOOM was charged with the manufacture and custom development of an absorbent to wipe up spills in the x ray development and coating process. "Everywhere that oil and chemicals are exchanged you're going to have spills," said Weinstein, adding the company has the products to clean up messes, whether its from manufacturing or materials processing. As testimony to the company's commitment to social responsibility, BOOM Environmental Products recently announced a partnership with the Falmouth Mass.-based Whale Adoption Project as part of an on-going effort to preserve and protect wildlife and the environment. Through this affiliation, BOOM will donate a portion of its sales proceeds to the project, an initiative designed to protect and preserve the many species of the popular mammals. "We pride ourselves in our commitment to customer satisfaction and environmental protection," said Weinstein 'Through our high quality, comprehensive line of products and knowledgeable staff, we work as partners with our customers to provide innovative solutions to spill control problems." From start to end, I've never dealt with a vendor who was so willing to conform his product to our specifications. As testimony to the company's commitment to social responsibility, BOOM® Environmental Products recently announced a partnership with the Whale Adoption Project, (Falmouth, MA). Through this affiliation, BOOM will donate a portion of its sales proceeds to the project, an initiative designed to protect and preserve the many species of the popular mammals. These (absorbent) pads will be used in the fabrication of a Vapor Compression Distillation System to be flown aboard the space shuttle in the year 1997. The material can be custom-shaped, depending on the application. During the Valdez spill, for example, it was sewn into 10 ft. long booms that could easily be connected to form as long a span as necessary. BOOM offers products to absorb everything from the lightest jet fuel to crude oil... What is different about their sorbents is that they absorb up to 25 times their own weight and are reusable up to 110 times. BOOM has developed a unique partnership with industrial launderers and dry cleaners. For $1.50 a pound, customers have their used absorbent materials dry cleaned and returned. Copyright © 2016 BOOM Environmental. All rights reserved.